Rugby star and sports commentator Austin Healey has avoided the usual scrum for a new Jeep Grand Cherokee, after signing up as an official UK brand ambassador to the 4x4 manufacturer. a new car like this that has everything," said Austin. 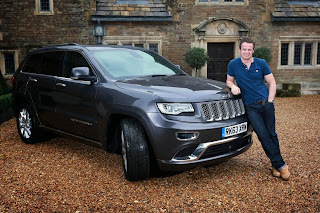 "I travel all over the country to the top rugby grounds, and for other business commitments, and I also use the Jeep for the school run and day-to-day movements, and I've been very impressed with it." Austin will use his new car to fully embrace the partnership with Jeep, as he plans to make several personal appearances at Jeep dealer events across the UK. Jeep is also now the sponsor of Austin's weekly column in the Daily Telegraph each Saturday. "Working with such an accomplished sportsman as Austin Healey is really exciting for us," said Nigel Land, Brand Director, Jeep Chrysler UK. "He's well respected in the world of sport, and echoes our core values of adventure and challenging yourself. We're very much looking forward to the months ahead." With 247 bhp and 570 nm of torque available from the 2,987 cc V6 turbo diesel engine, coupled to a smooth eight-speed automatic gearbox, the new Grand Cherokee delivers premium on-road performance while maintaining Jeep's legendary four-wheel drive torque-on-demand off-road capability. Now with significantly lower emissions than the previous Grand Cherokee together with fuel consumption of up to 37.7 mpg (combined), the new car also offers real value in terms of running costs.